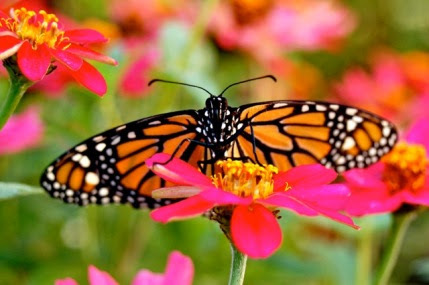 When you think of monarch butterflies, you probably dream of a picture like the one above with a butterfly nectaring on a pretty flower, such as a zinnia. Butterflies need TWO things- they need nectar from flowers, for sure. But before that, they need what are called larval food plants. Every butterfly species has a specific larval food plant that they MUST lay their eggs on. When the eggs hatch, the caterpillars can ONLY feed on this specific larval food plant. 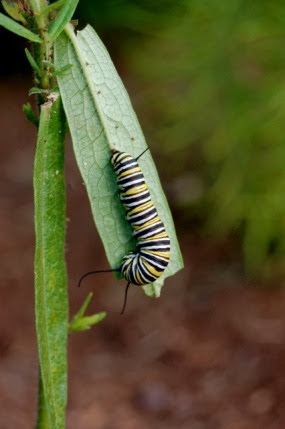 Diane captured this amazing photo of a monarch caterpillar feeding on Asclepias leaves. In the case of monarch butterflies, their main larval food plant is milkweed (as well as its many relatives in the Asclepias family). 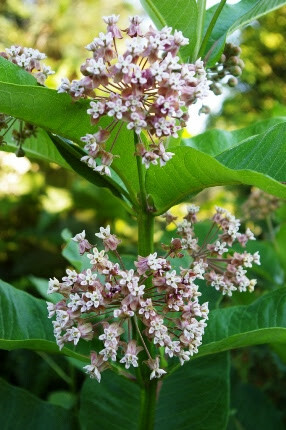 Milkweed used to be a very common plant, found along the roadsides, in hedgerows, and gardens. Because it was deemed “a weed”, much of it has been eradicated, often through the use of strong herbicides. Milkweed flowers are really fragrant! We have always had some milkweed growing on our property at Natureworks. Teachers would come and harvest leaves for their school projects. People would ask to buy it and I would tell them to come back in the fall and collect the seeds. Last year, we finally decided to sell milkweed plants. We sold out quickly, as soon as our shipments arrived. With all of the publicity about neonicitonoids in plants poisoning creatures, we decided to contract with a CT grower to grow milkweed plants without the use of any chemicals. These will be arriving in late May. You can reserve your plants by clicking here and placing an order. We will be carrying certified organic orange butterfly weed plants. We have organic seed in stock for both the orange and pink forms as well. 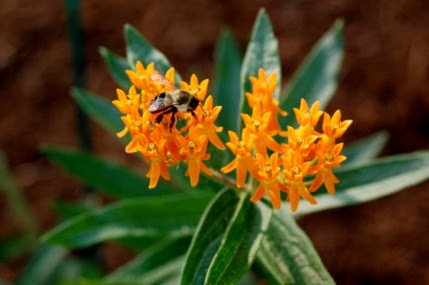 We also will be carrying organically grown Asclepias tuberosa, the orange butterfly weed, (another larval food plant for monarchs) and a very beautiful perennial for the sunny garden. We have certified organic butterfly weed seeds as well. We will certainly be devoting many summer workshops and walks to these precious and lovely creatures. 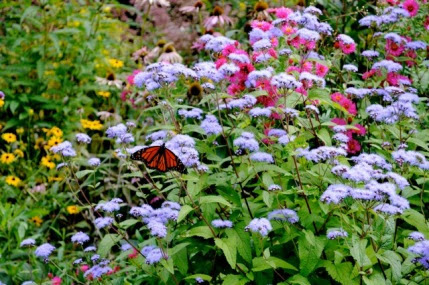 How many monarch butterflies did you see in your garden last year? Not too many I bet. Let’s join together and provide plenty of opportunities for monarchs to grow into a healthy, large population in CT this summer. They will then head off to Mexico to migrate for the winter. Who knows? If we continue to raise them and tag them, we might just someday find out that some of our own monarchs were recorded on the Monarch Watch website.